Newcastle upon Tyne City Tours begin again next week – the first walk takes place on Sunday 8th April 2018. Meet at Newcastle Guildhall. Finish at Sage Gateshead. A circular route around the Quayside from the Guildhall, covering both Gateshead and Newcastle and their contribution to the coal industry of the 19th and 20th centuries. This walk will also cover the decline of coal and the re-invention of NewcastleGateshead as a cultural capital This walk includes some steep slopes and steps. Meet at Greys Monument Finish at The Guildhall. Markets have always played an important and vibrant part in the lives of the people of Newcastle, making a valuable contribution to the economy of the area. Join us to discover where everyone shopped for their basic provisions and visit the sites of the old and new markets of the city. Meet at Newcastle City Library entrance, Princess Square, Newcastle. Finish at Wesley Square, Newcastle Quayside. John Wesley visited Newcastle many times in the latter half of the 18th century. This walk takes us through parts of the town he would have known, with reminders of buildings with which he was associated, some of which are still standing, others long gone. There are stairs down to the Quayside but an alternative is available if needed. Meet at Newcastle Castle. Finish at Blackfriars. 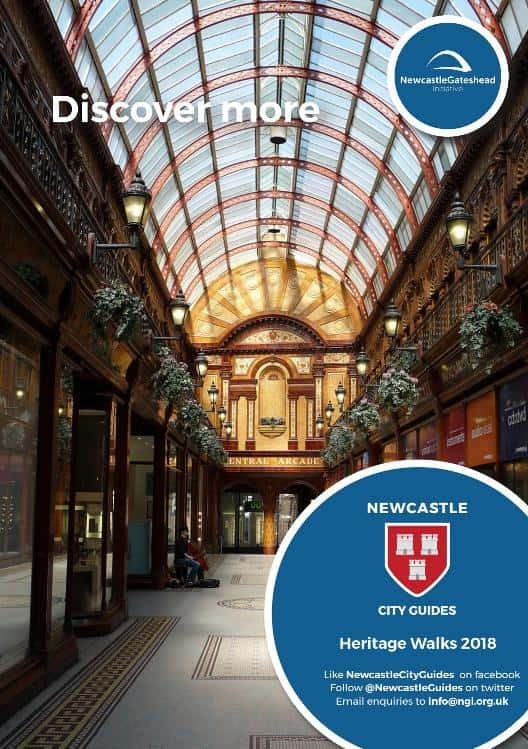 Explore the intriguing mixture that is Newcastle including the medieval castle, religious houses, 18th century fashionable houses and buildings for the city’s elite, prestige commercial buildings and our fine 19th century railway station. There are even mentions of the Roman presence. This walk includes some steep steps. Meet at Haymarket Metro Station, Northumberland Street entrance (opposite South African War Memorial). Finish at Newcastle Central Station. This walk celebrates the women who campaigned for the vote. Find out where Emily Wilding Davison was arrested in Newcastle and how Newcastle women met, marched, and behaved badly, to win the vote. Meet outside St. Cuthbert’s Church, corner of Bensham Road and Derwentwater Road (NE8 ZHB). Finish at Barrington Place, Bensham Road. Bensham was Gateshead’s first suburb, but how did it begin and why? How has it changed? Roll back the years and discover something of Bensham’s unique but often very hidden history. Meet at Haymarket Metro Station, Northumberland Street entrance (opposite South African War Memorial). 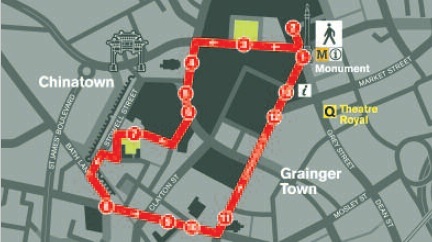 Finish at Grey’s Monument: This walk follows a well-trodden path as it winds around town. Learn about the history of these streets and why they have names such as Darn Crook or Newgate. Meet and finish at Tynemouth Metro Station under the clock. A circular walk via Northumberland Park providing an interesting insight into Victorian social history in Tynemouth. We look at how people used the new recreational facilities and the punishment they could expect if they broke the law. This walk includes some uneven ground, some steps and steep slopes. Meet and finish at South Shields Metro Station, King Street entrance. Renowned for its rich maritime history, this walk takes us along the riverside to find relics of its industrial past as a busy port, it was home to sailors, press gangs and smugglers. Look our famous smuggler in the eye! There are stairs down to the riverside but an alternative route is available if needed. Meet at Newcastle Guildhall. Finish at Carliol Square. Come along to hear about where the poor of Newcastle lived and worked. Hear stories about almshouses, Overcrowded slums, fever dens, beggars and soup kitchens. Steps make this walk unsuitable for people with limited mobility. Meet at Joseph Cowen Memorial, Westgate Road. Finish at Thomas Spence Memorial Plaque, Newcastle Quayside. Tyneside, with its long tradition of radical politics, has welcomed many individuals and groups fighting for equal suffrage. This walk looks at some of the men before 1900 who gave Newcastle its reputation as a centre of radicalism. The route takes a steady, but steep, downhill route, and has some steps which may make it difficult for people with limited mobility. Meet and finish at North Shields Metro Station. From the origins of a small fishing port to the growth of a town, this walk takes us around the top part of North Shields. Discover why coal caused conflict, where a Hollywood legend spent his youth and how he is now remembered. Meet and finish at The Ship Inn, Stepney Bank. Join us for a tour of this fascinating area. We look at the history and redevelopment of the valley with bridges towering above and a burn down below. Today the old industrial buildings are being reborn and include art studios, music venues and riding stables as well as other major visitor attractions. Meet under the Council Chamber, Newcastle Civic Centre. Finish at Westgate Road/Clayton Street junction. These boots are made for walking – are yours? This tour recreates the social culture of the swinging 1960s in Newcastle. Join us on a magical mystery tour of yesteryear, when man stepped on the moon, Strawberry Fields were forever and a pound in your pocket could last you all week. Meet at Haymarket Metro Station, Northumberland Street entrance (opposite South African War Memorial). Finish at Newcastle Quayside. Explore the history of Newcastle pubs from Haymarket to Quayside with characters and stories to whet your appetite if not your palate. A steep slope (The Side) is part of this walk. Meet at Grey’s Monument finish at Newcastle Guildhall. This walk looks at many religious buildings and sites, including monasteries, parish churches and cathedrals and explores the political, economic, and religious implications of the Reformation on Newcastle. Meet and finish at junction of Belle Vue Bank and Durham Road, Low Fell (opposite the New Cannon). Discover how a pitman, an enterprising publican and the development of a new road changed Low Fell from an area of desolate waste to a prosperous Victorian suburb. Meet at Arbeia Roman Fort, Baring Street (NE33 2BB). Finish at Ocean Road. This walk focuses on the maritime heritage of South Shields and the town’s motto ‘Always Ready’. It includes Arbeia Roman Fort and the Lawe Top area with spectacular views of the harbour and mouth of the Tyne. This route includes a steep flight of stairs from the Lawe Top area, however an alternative route is available. Meet and finish at Jesmond Dene Real Tennis Club, Matthew Bank, Jesmond, (Nearest Metro Ilford Road). A tour of Sir Andrew Noble’s purpose built (1882) Real Tennis Court, including an exhibition display of the game by a professional and an explanation of the rules. Real or Royal Tennis was the sport of Kings and today’s lawn tennis is a relative ‘newcomer’. Refreshments can be purchased. Meet at St Edmund’s Chapel, Gateshead High Street, Finish at Dean Street/Mosley Street junction. A walk remembering the life and times of Geordie Ridley, the places he knew and the people he wrote songs about, from bobbies to muckmen, from Chambers to Stephenson. This walk contains some steep slopes and main roads to cross. Meet at Sunderland Metro Station. Finish at Sunderland Minster. An interesting walk through the 19th Century Fawcett and Sunniside estate, one of Sunderland’s hidden gems. Look over the riverside to Monkwearmouth and the River Wear, finishing at Bishopwearmouth and the recently regenerated cultural heart of Edwardian Sunderland. Meet and finish at Whitley Bay Metro Station. Find out how the village of Whitley grew into the major seaside resort of Whitley Bay. See how the famous Spanish City and Promenade are being restored to their former glories and discover some less obvious significant historic items during our walk. Meet at South Gosforth Metro Station (west side, corner of Rectory Terrace). Finish at St Charles RC Church, Church Road. A gentle walk looking at the religious side of Gosforth, Starting at St Nicholas Church, with an inside visit and tour of the churchyard and its graves. Following a short walk, with reminders of coal and post-war housing, we finish with an inside visit to St Charles’ RC Church. Meet at Newcastle Guildhall Finish at St John’s Church, Grainger Street. A perambulation around today’s Newcastle to trace the town within the walls from the 1300s. We will discover the extent of walled Newcastle locating the churches, monasteries, markets, civic administration, walls, steps, streams and fairs. This walk includes some steep slopes and steps to negotiate. Meet at Grey’s Monument. Finish at Westgate Road. Have you ever sat on the top deck of a bus and wondered who the carved heads staring back at you are? There are many faces depicted on buildings in Newcastle and this walk takes us around town to find these heads and discover some of the tales behind them. Meet and finish at Exhibition Park main entrance, Claremont Road. Visit a small, tucked away village where coal mining, furniture making, brewing and a lunatic asylum sat cheek by jowl with upper class housing. Meet and finish at Shipley Art Gallery, Prince Consort Road (NE8 4JB). Take a pleasant stroll around the Shipcote area of Gateshead and hear Some fascinating history about pastures, parks and the Civic centre that it nearly became. Includes a visit to the gallery to enjoy Mr Shipley’s generosity in providing an art gallery. Meet at Discovery Museum main entrance, Blandford Square. Finish at Half Moon Lane, Gateshead. Celebrate the life and work of Robert Stephenson, the only son of George Stephenson, the ‘Father of Railways’. This walk gives an insight into the background of his family life, early career and the creation of impressive engineering structures that are still part of North East life today. Meet at Cardinal Hume statue, opposite Newcastle Central Station. Finish at St Nicholas Cathedral. This walk celebrates Thomas Bewick, one of Tyneside’s most famous sons. It takes us from his arrival in Newcastle to begin his apprenticeship with Ralph Beilby and through Bewick’s Newcastle, where he lived and worked. Meet and finish at cemetery gates south side of Jesmond Road. Explore this 19th century private cemetery, the resting place for many of Newcastle’s eminent citizens. Please wear suitable footwear as some areas of the cemetery are overgrown and can be slippery, especially in wet weather, and the ground is uneven in places. Meet and finish at Manors Metro Station. An interesting circular walk highlighting some gems of information about this little known part of Newcastle. Starting at Manors Metro station we will explore long forgotten Gibson town, Shieldfield and surrounding areas. There are a number of steps and a steep bank on this route which may make it unsuitable for the less mobile. Meet at Laing Art Gallery. Finish at Times Square. Celebrating the best known buildings by John Dobson, this walk looks at Dobson’s own house, takes in Old Eldon Square to the Old Cattle Market via Grainger Town, and includes his masterpiece, Central Station. Meet at Alderman Fenwick’s House, Pilgrim Street. Finish at The Redhouse, Sandhill. Visit buildings where prosperous merchants conducted their businesses and family lives. The tour includes inside visits to Alderman Fenwick’s House and Bessie Surtees House with an external study of the Cooperage and House of Tides, finishing at The Red House inside and out. Some of the visits include stairs that may make this walk unsuitable for those less mobile. Meet at North Shields Metro Station. Finish at Old Low Light Heritage Centre. See where industry and fishing once thrived and discover a hidden WW2 structure, the notorious ‘Jungle’ and a famous ‘Wooden Dolly’. This walk includes steep slopes and some steps to negotiate. Meet at Cardinal Hume statue, opposite Newcastle Central Station. Finish at The Boiler Shop, Stephenson Works. This walk takes a circular route in and around the magnificent Grade I Central Station with access to the world’s first locomotive works. The emphasis is on George and Robert Stephenson and the latest developments around the historic Stephenson Quarter. Meet and finish at Jesmond Metro Station. Brandling Village is an excellent example of a Victorian and Edwardian suburb essentially developed between 1820 and 1920. This walk takes in the original 19th century core and its surrounding grand streets and houses. Meet and finish at park entrance opposite Little Theatre, corner of Saltwell View and East Park Road, Gateshead. Walk around this beautiful Victorian park discovering stories of past and present. Explore the oddities of Saltwell Towers and hear tales of the park’s oldest inhabitant and the story of the disappearing bandstands! Meet and finish at South Shields Metro Station, King Street entrance. Join our renamed walk around the centre and riverside of South Shields. Sitting at the mouth of the Tyne, South Shields has a long history from Roman times to the modern day. Strong links to seafaring and industry have seen the town boom, decline and grow again. Meet at car park on Staithes Road, NE11 9DR opposite Dunston Excelsior WMC. Finish at Dunston Staithes. A unique walk exploring the history of Dunston Staithes and the industry that would have been visible on both banks of the Tyne. The walk will take us onto the actual Staithes, one of Europe’s largest timber structures. Steep steps onto the Staithes – an alternative ramp will be open. Meet and finish at the War Memorial, Wordsworth Street (near to Gateshead Stadium Metro). Explore Gateshead’s first Victorian civic cemetery and discover the earlier St Edmund’s burial ground. Hear tales of Gateshead’s industrialists, cemetery intrigue and strife and find the grave without a body as well as a grave to a famous rower who died in mysterious circumstances. 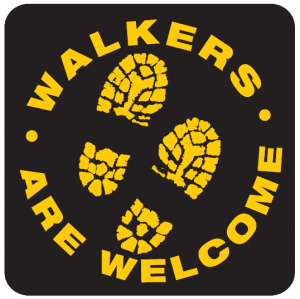 This walk involves walking over uneven ground – please wear suitable footwear. Meet and finish at Queen Victoria statue on the village green near Tynemouth Metro Station. Stroll through the centuries in this historic coastal village to hear stories of seafarers, saints, inhabitants and invaders of old Tynemouth on this re-titled circular walk. Please note, due to a steep incline this route is unsuitable for people with limited mobility. Meet and finish at Grey’s Monument. A walk that encompasses all that is beautiful in Newcastle’s classical architecture, from the curved lines of Grey Street and it’s majestic Theatre Royal to the imposing Grainger Market. Hear about Richard Grainger, the man who made it all possible. Meet at Chinese Arch, Stowell Street. Finish at Newcastle Central Station. Music hall was one of the most popular forms of affordable entertainment in the Victorian period. Take a look at the places where the most popular stars of the time, including Joe Wilson, Geordie Ridley and Ned Corvan, played to packed houses and wowed people with their songs of local events and characters. Meet under the Council Chamber, Newcastle Civic Centre. A special visit on the Civic Centre’s 50th Birthday takes you behind the scenes. Walk the corridors of our Civic Centre, with a rare opportunity to climb the Carillon tower to look across the city. Please note that access to the Carillon tower is only possible by climbing a set of steep and uneven stairs. Meet at South Gosforth Metro Station (west side, corner of Rectory Terrace). Finish at Regent Centre Metro Station. This walk explores the development and enlargement of the suburb of Gosforth including its industry, pastimes, housing and education. A footbridge with steps makes this walk unsuitable for the less mobile. Meet at Grey’s Monument. Finish at Exchange Buildings, Newcastle Quayside. This walk looks at the role Newcastle played as industry and innovation flourished in the 19th century. Find out where Stephenson built locomotives, where Swan first demonstrated his electric light bulb and how Armstrong and Parsons established factories which eventually employed thousands of workers. The route takes a steady, but steep downhill route, which may make it difficult for people with limited mobility. Meet at Grey’s Monument. Finish at Blackfriars. Medieval Newcastle had one of the strongest town walls in England. See the West Wall with its towers and unique turrets before reaching Blackfriars, one of the country’s few remaining medieval friaries. Meet at west door of Sage Gateshead. Finish at Swing Bridge (Gateshead end). Discover how early railways, industries and bridges have now been joined by modern art and find out just what Sage Gateshead’s car park was originally used for! Meet and finish at St George’s Church, junction of Osborne Road and Lindisfarne Road (nearest Metro West Jesmond). This tour explores North Jesmond and part of Jesmond Dene. It visits the sites of some of the area’s magnificent mansions and grand houses, including those of shipbuilder Charles Mitchell and industrialist Sir William Armstrong. Following this two hour walk there is a guided tour of the exceptional Grade I listed St George’s Church with optional refreshments available afterwards. Some uphill walking and a flight of steps are included on this walk. Meet at Cullercoats Metro Station. Finish outside Monks Haven (Cullercoats Bay). Learn something of the history of this fascinating coastal village including the important industries of the past, the people who lived and worked here and its landmark church. This walk includes somme steps and uneven ground. Meet at Cardinal Hume Statue opposite Newcastle Central Station. Finish at Discovery Museum. An early 19th century development, Summerhill is a delightful but little known backwater. Come and explore this hidden area, home to some of Newcastle’s prominent Quaker families. Find out where Robert Stephenson lived and where the Victorian cricketer WG Grace played bowls. Meet and finish at entrance gates of Preston Cemetery. North Shields. This walk remembers the lives of several local people including a Dame of the British Empire, a brave young man who won the George Medal and a pioneering journalist who went down with the Titanic. As there is some uneven ground suitable shoes are advisable. Meet at corner of High Street and Moor Road South, Gosforth. Finish at All Saints Church. Enjoy a stroll around Gosforth looking at many of the great houses and remembering when this was the place for the seriously rich to live. Meet and finish at Newcastle Guildhall. A circular walk around the Quayside with ghost stories, witches, bodies fished out of the river and murders on both sides of the Tyne. This walk includes some steep slopes. Meet at Grey’s Monument. Finish at Gateshead Millennium Bridge, Newcastle Quayside. Discover why Irish refugees fleeing the 1845 Potato Famine were welcomed on Tyneside and examine the part played by Tyneside Irish Nationalists seeking an independent Ireland. This walk includes some steep slopes or steps. Meet at Wallsend Metro Station. Finish at Wallsend Green. The name ‘Wallsend’ has links to the Romans and Segedunum. This walk remembers former great industries and some of the local ‘heroes’ from the town. The route includes memorials, the ‘Penny Wet’ and places of education on the way to the quite unexpected village green. Meet at Newcastle end of Swing Bridge. Finish at St Thomas’ Church, Haymarket. From the site of the Chapel of St. Thomas on the medieval bridge to its early Victorian replacement at Barras Bridge, this walk visits several sites of religious significance. On the way, you will hear the story of an agile bricklayer, of boilers used for soup as well as prison laundry. A secret chapel and a city centre church moved brick by brick to Byker. The route takes a steady, but steep climb which may make it difficult for people with limited mobility. Meet at Grey’s Monument Finish at Broad Chare, Newcastle Quayside. Do you dare join us at Halloween for this popular walk? Who will we bump into on our route around haunted Newcastle? This walk looks at the traditions and stories linked to All Hallow’s Eve and the city. This walk includes some steep slopes or steps. Meet at St Thomas Church, Haymarket. Finish at Grainger Market. This is a walk about Newcastle in times of conflict, not just in the Great War but throughout the centuries. Join us to remember the fallen as well as some of those who survived. Learn something of the history of this fascinating coastal village including the important industries of the past, the people who lived and worked here and its landmark church. This walk includes some steps and uneven ground. Wooden mice, Dominican friars, Marks & Spencer’s Penny Bazaar, and an Earl. When it comes to grandiose views, Earl Grey – former Northumberland MP and Prime Minister – has got it spot on. He’s the fellow perched atop 1. Grey’s Monument, casting his gaze down the street which he gave his name to. Grey Street (voted the most beautiful in the country by the listeners of Radio 4 and the Commission for Architecture and the Built Environment CABE) is indeed a magnificent sight and the work of visionary property developer Richard Grainger (B.1797). Starting in 1834, Grainger set about transforming Newcastle, with his classically designed streets all part of his “City of Palaces” blueprint. Grey’s Monument itself is regarded by many as the centre of modern Newcastle and was erected in 1838 to commemorate Earl Grey’s achievements in passing the Great Reform Bill of 1832. Behind the Earl is Blackett Street and the Emerson Chambers building, a fine example of the Art Nouveau style. If you cut down between this building and the Newcastle United club shop (a black and white scarf is optional at this stage), you’ll discover 2. Brunswick Methodist Chapel, one of the earliest of its type in North East England. Back onto Blackett Street, turn right, and continue along and you’ll find 3. Old Eldon Square on your right. This houses the city’s war memorial: a bronze statue of St. George – the patron saint of the Northumberland Fusiliers – slaying a dragon. Continue along Blackett street, and under the bridge, and you’ll see 4. St. Andrew’s Church, on Newgate Street. Structurally the building contains more 12th century work than any other in the area making it “the oldest church of this town” and to the rear of it you can see a short stretch of the medieval town wall (more of which, later). Following through a little archway towards the top end of Blackfriars (straight ahead from where you entered it), takes you onto Stowell Street, home to Newcastle’s Chinatown. You’ll be greeted by a wonderful array of aromas informing you that you’ve reached the best Chinese restaurants in town! Turn left and at the end of Stowell Street you’ll see the West Walls, the longest section of the original town walls – built between 1280-1283 to protect the city – still surviving today. Following the wall down the slope will lead you onto Westgate Road, where you’ll see 8. The Journal Tyne Theatre (opened in 1867), one of the most important theatres in the country, housing its original 19th century stage machinery. Continue down Westgate Road, over Clayton Street, and you’ll reach the 9. Newcastle Arts Centre on the right hand side. In the open courtyard of the centre are the remains of a corner of a Roman milecastle. The Arts Centre is also a great place to pick up a gift and houses a gallery and a potter’s studio. Continue down the road to see the graceful 10. Assembly Rooms (built in 1774) on the left, and a little further, 11. St. John’s Church on the corner of Grainger Street. Inside the church are a range of interesting features including a commemoration to Richard Grainger himself. Also pay careful attention to the wooden choirstalls in the north aisle and see if you can spot the little wooden mice which were carved by the Yorkshire craftsman Robert “mousey” Thompson, who developed that particular trademark as an indication that he and his fellow craftsmen were “as poor as church mice”. Back out and onto Grainger Street and again, your chance to take in the magnificence of Grainger Town’s buildings as you head back towards Grey’s Monument. Along the way, be sure to stop off at the 12. Grainger Market, the covered market on your left hand side. Thought to be designed by John Dobson – who worked closely with Grainger – the market contains many shops which have been in the same family for generations, and is still home to one of the original Marks and Spencer’s Penny Bazaars (built in 1895, with its shop front being the smallest, and oldest, still surviving today.) Finally, just before Grey’s Monument and Monument Metro station, you’ll see the beautifully tiled Edwardian 13. Central Arcade (1906) on your right hand side. This is another of Grainger’s creations and the perfect way to end your stroll through Newcastle’s “golden heart”. If you are interested in more NewcastleGateshead walking guides we can send you a free 13 page copy of the guide, just fill in your email address below. (No spam we promise, we will not re-use or re-sell your email address). If you are looking for bed and breakfast accommodation for your walking holiday to Newcastle upon Tyne you can check our guest house room rates and availability on our Book Online page.